Owner picking and cleaning horse's hoof. Miles of concussive forces over miles or dirt, rock and sand mar this loose horseshoe. Note the bent nail on the right branch. Nothing is more frightening than having your horse turn up lame, refuse to walk, or have a shoe come loose and start to clang along the trail while you are miles away from the stable. Every horse owner should be prepared for these emergencies when a veterinarian or a farrier cannot be called immediately to deal with an emergency that might affect the future soundness of the horse. Your first course of action is to be prepared. Hoof care emergencies usually happen without warning. Practice trailering your horse so that if an emergency arises, your horse will be cooperative in entering the trailer and being transported to the veterinarian or an equine hospital. Know what to do under different circumstances requiring emergency hoof care and recognize symptoms of injuries, diseases and conditions. Keep your veterinarian's and farrier's phone numbers readily available in all places and at all times. If your horse steps on a nail or other sharp object that doesn't remain embedded in the foot, cleanse the wound, apply antiseptic to the wound and wrap it to prevent additional contamination. If your horse throws a shoe while out on the trail or if a shoe comes loose, protect the hoof from damage or injury by pulling the dangling shoe and using a hoof boot to protect the hoof until you can get back to the stable area. If your horse shows up lame, check for puncture wounds. Clean the bottoms of the hooves thoroughly and look for rocks, nails, glass or any other foreign object that could cause damage. Look carefully for hidden puncture wounds. Feel the coronary band for heat that might indicate an abscess within the foot. Any puncture would in the horse's sole should be considered an emergency. Contact your vet for advice BEFORE attempting to remove the object. All but the most minor hoof problems require the services of a veterinarian or farrier. 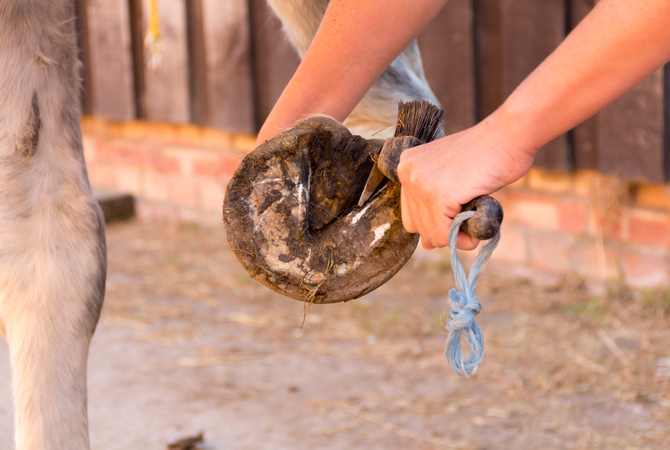 Any time there is an indication of a hoof disease, an abscess, or serious hoof condition, your veterinarian should see the horse as soon as possible. Don't wait several days to see if the problem resolves itself. After all, the soundness of your horse may be in jeopardy and early treatment of hoof problems will save you both time and money. If the problem is with the shoes, the trimming of the hooves, an alignment or balance problem, your farrier can most likely take corrective action. 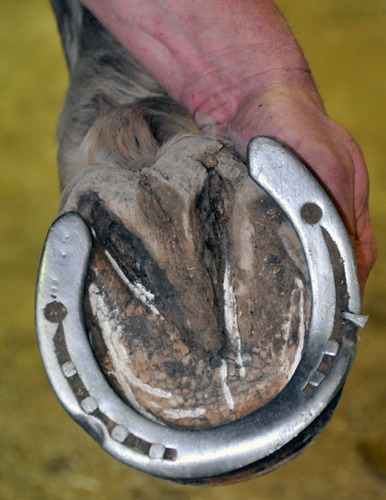 In addition, a farrier can locate bruising, puncture wounds, and the beginnings of hoof disease during the inspection of the horse's feet using hoof testers. In their native habitat, horses wore their hooves down in a natural fashion. The domestic horse that lives in paddocks, pastures and stables, receives infrequent exercise with limited opportunity to toughen its feet is susceptible to a number of hoof problems. Daily inspection, routine hoof cleaning before and after every ride, or several times a week when the horse is not being ridden, routine hoof trimming and application of horseshoes for those horses that require them will prevent many hoof problems. Once you have established a good working relationship with your veterinarian and farrier, they most likely will be willing to teach you how to recognize hoof problems that may lead to emergencies and instruct you in ways to both prevent and treat emergency hoof problems.